Greek Week is a battle of the Greek letters, but it’s also a time when fraternities and sororities work together to raise money for Relay for Life. During this competitive season, Greek organizations are divided into seven teams and must earn points in various challenges for the coveted trophy and title of Greek Week Winner. This year, the theme for Greek Week was MTV music genres and was held from Feb. 19-25. Each team was made up of three or four different Greek organizations and had a music genre, such as jazz, country or pop. The first event asked Greek organizations to attend the UT baseball game and answer trivia questions about music and baseball. The second event was Don’t Forget The Lyrics, where contestants had to sing the lyrics perfectly to songs like Hallelujah by Leonard Cohen and Crazy in Love by Beyonce. “I think it was a fun beginning for the whole week; everyone was laughing,” said Amanda McAneney, junior marketing major and co-captain of Sigma Kappa’s team. McAneney was excited to participate in Greek Week for the first time, as this is Sigma Kappa’s first year on UT’s campus. Team Alternative won first place with 40 out of 50 points for correctly reciting the lyrics. On Feb. 21, a fashion show was held in Reeves Theater, during which the different teams displayed outfits of Greek letters, formal wear and music genre attire. Contestants then had to answer questions about Greek life on campus. The fashion show raised money for the Crisis Center of Tampa Bay, which provides sexual assault victims with clothes and shoes. “We give victims forensic exams and tell them what their rights are,” said Sascha Cherry, a victim advocate from the Crisis Center. “We can help walk them through the legal process of sending kits to the lab, and can help them get restraining orders.” The fashion show raised a total of $309 and 186 of donations of flip flops and deodorant for the Crisis Center. The fourth event was Race to the Red Carpet, where team members had to use their problem-solving skills to get from one end of the Cass gym to the other, only using a tiny square scooter, a couple pieces of cardboard and a rope. They also had to complete a Wipeout-inspired obstacle course. The game got intense as teams yelled from the stands to become the fastest to complete the challenge. “It was fun cheering on teammates, and there were a lot of strategies put in place, so it was cool to see how different people think,” said Bobby Mairone, sophomore visual arts major and member of Lambda Chi Alpha. Team Pop won with 100 out of 105 possible points. Although the week is full of competition, many say that they love getting close to the other Greek chapters on campus. The fifth Greek Week event was organized by Career Services and featured a presentation from representatives from WilsonHCG, a talent acquisition solutions partner, whose headquarters is in Tampa. Cynthia Cancio, the Vice President of Employee Engagement at WilsonHCG, explained how members of Greek Life can enhance their resumes and Linkedin profiles to appeal to employers. She gave tips like having a neutral background in a profile picture, writing a resume in first person, and taking a targeted approach to each resume so that it suits the job that one is applying for. Friday’s Greek Week event was a chalk-drawing competition, where each team got a certain amount of chalk and a limited time to create a colorful masterpiece in Vaughn Courtyard that represented their team music genre. Team Rock won with a total of 91 points out of 100. 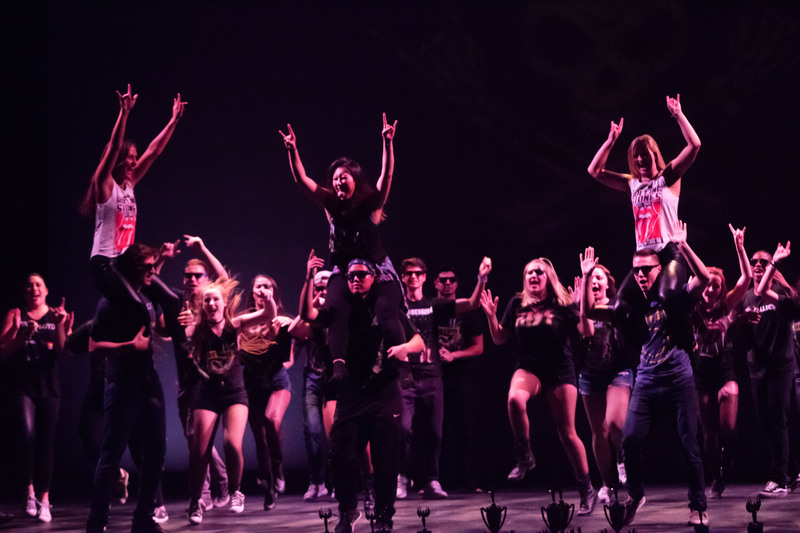 The Greek Week finale consisted of the Greek Variety Show, which was held on Feb. 25 and involved each team performing numerous songs and dances relating to their MTV theme. Team Pop came in first place with a score of 200 out of 200 possible points. The overall Greek Week winner was Team Country, which included Sigma Kappa, Tau Kappa Epsilon, Alpha Kappa Alpha Sorority Inc., and Phi Beta Sigma Fraternity Inc. Greek Week concluded with a revealing of how much money was raised for Relay for Life, which came to a grand total of $9,560.69. Liz MacLean can be reached at liz.maclean@theminaretonline.com.